About-France.com - A thematic guide to Ffrance . Cheap hotels or hostels offering very basic but acceptable accommodation essentially for younger travellers. Two or three star hotels providing the essential comforts for visitors on a limited budget. High-end three star hotels and above, boutique hotels and other hotels offering comfortable and fully serviced accommodation. 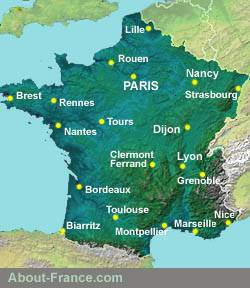 On this page, About-France.com has carefully selected a choice of hotels near the main railway stations in France. All hotels on this page are in easy walking distance of the station, and are good bases for anyone travelling round France by train. If visiting a city for a night or two, it makes sense to take a hotel close to the station, and avoid having to lug bags and suitcases around with you more than necessary. As an added cost advantage, without your bags you may prefer to walk into town, see the sights as you go, and save on expensive taxi fares. ► Other cities : Lille, Avignon, Cannes, Grenoble, Besanï¿½on, Tours etc. Small traditional Paris hotel 5 minutes on foot from the Gare du Nord station. In walking distance of Sacrï¿½ coeur. Easy access to the rest of Paris by bus. 45-room hotel located on Avenue du Maine close to the Montparnasse railway station (trains to Bordeaux, Brittany, western France etc) . Restaurants and public transport close by. Modern 185-room hotel located on a small street close to the Montparnasse railway station (trains to Bordeaux, Brittany, western France etc) . Easy access to the whole of central Paris. Located just a few minutes walk from the train station and tourist attractions including the castle, the cathedral, and the museum, this is a handy base for anyone visiting Nantes without a car. Just called "L'hï¿½tel" (nothing more) this is a small midscale hotel a few minutes from the train station. Rooms either look out over the castle (the front of the hotel) or onto the gardens at the back. Small comfortable hotel, friendly staff, rooms average size. ECO - Ibis hotel Nancy centre gare This hotel right next to the train station offers modern 82 air-conditioned rooms. Predictable Ibis quality, clean and well maintained but little in the way of character. Reasonable value for money. The Place Stanislas and the historic city center are in easy walking distance. By Nancy standards, this hotel is quite cheap; the rooms are small but clean, and the staff are friendly. But this is a fairly basic two-star hotel, fine for a night or two but not perhaps the kind of place you'd want to stay in much longer. It is, however, right beside the railway station. Hotel located opposite the railway station, and a good choice for visitors arriving by train. This air-conditioned upper ** hotel, with swimming pool, is well located for exploring Dijon and the area, and is well reviewed by travellers. Restaurants close by. Almost next door to the Kyriad hotel, the 83-room Campanile is a cheaper option. Standard two-star chain hotel quality, not much character, but fine as a place to spend a night or two while visiting Dijon and the surrounding area. Rates at this hotel include breakfast + unlimited Wi-Fi. The 48-room hotel is located close to the railway station, and on the street leading to the historic city center. Easy access to the city center, cathedral, shops and historic Petite France area on foot or by bus. Modern upscale *** hotel across the piazza in front of the TGV train station, suitable for business trravellers and tourists. 10 minutes' walk from the city center and the picturesque "Petite France" district . The two star Hotel du Faisan is a traditional hotel located in a calm location on a pedestrian square opposite the Bordeaux Saint Jean station. It has 62 rooms . A simple hotel with friendly staff, and good value for money. Classic three star hotel just north of the Saint Jean station, between the station and the river. 37 rooms. Easy access to the historic city center by tram, or on foot. . Elegant modern four-star hotel, fully air conditioned, three hundred metres from the station. Located on the Allï¿½e Jean Jaurï¿½s, close to the Canal du Midi, and the historic centre of Toulouse. The hotel gets good reviews, apart from the price of the breakfast; but there are plenty of cafï¿½s nearby, where breakfast can be enjoyed at more normal rates. Just a couple of hundred metres south of the station, this is a modern one-star hotel. Rooms are clean but basic, and buffet breakfast is available. There are restaurants and bars at the station, and others nearby in the Part-Dieu area.. Traditional 37-room hotel is a quiet side street just a short walk from Lyon Perrache station. Friendly staff, basic facilities, good value for money. Good location in Old Lyon, between the two rivers. There are plenty of bars and cafï¿½s in this part of town. 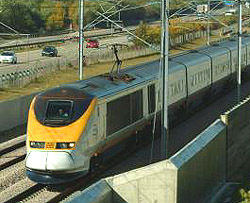 Trains link Perrache and Part-Dieu stations every few minutes. Located beside the station, the Ibis Gare St. Charles stands on a promontory overlooking the old city, so many rooms come with a view over the rooftops. Plenty of buses for transport into town, but the old port is only a ten minute downhill walk, the second half of it on the Canebiï¿½re, the city's most famous street. A five minute walk from the station, ten minutes from the old port, and close to the Canebiï¿½re, the most famous shopping street, the Hotel Lutetia gets generally good writeups. There is a friendly and homely atmosphere, rooms are small but clean and comfortable, and the staff are welcoming. Good value for money. This is the closest top quality four-star hotel to Nice railway station, slightly over 500m. It is a finely restored Belle Epoque hotel offering a level of service more in line with five stars than four. Indoor pool, spa, sauna, terrace, fitness room, bars and restaurants. Five hundred yards from the Promenade des Anglais and the sea. Large modern hotel, 199 rooms, right next to the Nice train station. Air conditioning, terrace, pool. Easy access by modern tram to the centre of Nice, the old town, and the beaches. Convenient location for discovering Nice and towns and villages along the coast (the railway follows the coast). This is a two-star hotel on rue de Belgique, a couple of hundred metres from the station. Compared to other low-cost hotels in the vicinity, it gets much more favourable reviews. The hotel has 40 rooms, and is in a part of town with shops, restau rants and other facilities..
To contact About-France.com, use the form provided. Copyright notice: Website and text ï¿½ About-France.com 2003 - 2019 except where otherwise indicated. ►Trainline.com French train tickets Best rates, no extra fee, no surcharge, seating choice. Available worldwide for print-your-own tickets or e-tickets.